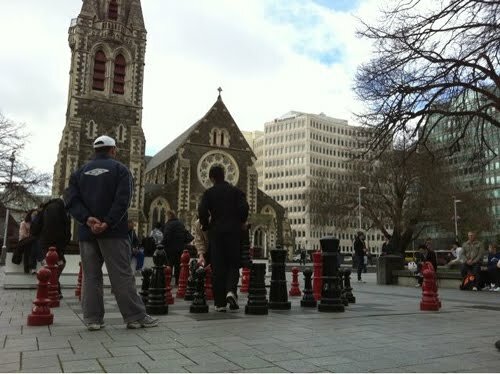 New Way to Look at Christchurch! How many friends do we really have? Yes, again, but once again the motel had no damage and is operating normally. In Christchurch everyone had a quiet Christmas day with no noticeable aftershocks. It was indeed a relief, perhaps too much of a relief. No sooner had the big day finished, we were revisited by aftershocks again. The first came just after 2am on 26 December, Boxing Day, and had us up checking that all was ok – yes we get used to it! Can’t remember if we noticed the 5.30am shake but we did notice the one just after 8am. It brought back memories of just after the September quake when we had numerous shakey shakes in one day – was today going to be another one of these days? We found out at 10.30am when we had a 4.9 aftershock – but was it an aftershock – technically yes but it felt more like an earthquake to us. The big difference was that the epicenter of this shake was at the corner of Moorhouse Ave and Montreal St. just over 2 kms from here, and it was shallow. It was a little frightening because the shaking was once again different from the other aftershocks we have been having, and as it turned out, it was more violent than the 4 Sep. shake. Luckily it was only 4-5 seconds long. Still, the damage was done and this time it was centered in the centre of the city. Many older buildings which escaped damage in the 4 Sep quake were not so lucky this time and once again buildings were getting red stickers on them. This time the damage was mainly limited to the central city area and our area escaped unharmed. Here at the motel, we and the building were shaken but once again we did not sustain any damage. 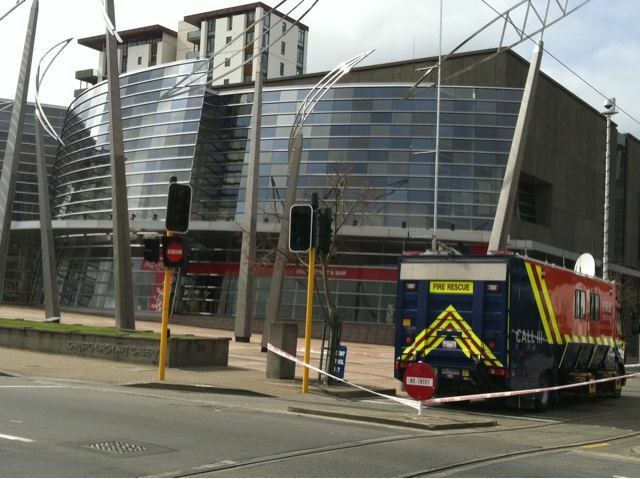 We can once again be thankful as no-one was injured and Christchurch just has another mess to clean up. Christchurch is once again shaken but we are still good! Now, 5 days on, while a few buildings still have fences around them, the cordons have all been lifted and tonite’s New Year Party in the Cathedral Square will go on as planned. We wish everyone a most wonderful New Year and look forward to welcoming everyone to Christchurch in 2011. Today we were treated to 2 heavenly spectacles in Christchurch, a wonderful Nor’ Wester sunset and a Lunar Eclipse. We were not only able to remember to look at the right time but we also managed to take a few picks to capture the grandeur of the moments. The Nor’ West wind flow fair wacked us today but it was worse down south towards Ashburton. Still, I had to tie up the trees to stop them being blasted out of shape! Towards evening we were treated to a 30 minute transitional light display as the setting sun lit up the Christchurch sky. The lunar eclipse was set for 9pm but no-one could find the moon. Troublesome. But towards 10pm Mr. Moon finally made an appearance and we were treated to our second celestial delicacy of the evening. It’s these small things that life is about! And just in case you did not see it we decided to point it out to you! Tomorrow may be somewhat boring with just a sunrise and sunset. Want to know what central Christchurch looks like at 7am each morning? Follow us on Twitter or Facebook to find out! This all started on 4 September, the day of the Canterbury Earthquake(blog). We never lost the electricity here at the motel but when I walked out onto Colombo St. around 5am and looked towards town, there was nothing. The whole central city area was enveloped in darkness. Believe me, that was a strange feeling. 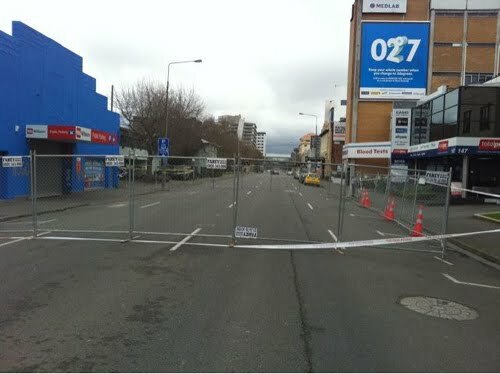 That started my habit of walking out onto Colombo St. each morning, usually when I got the newspapers, and looking towards the central city – can’t explain why, Christchurch has always just been Christchurch. 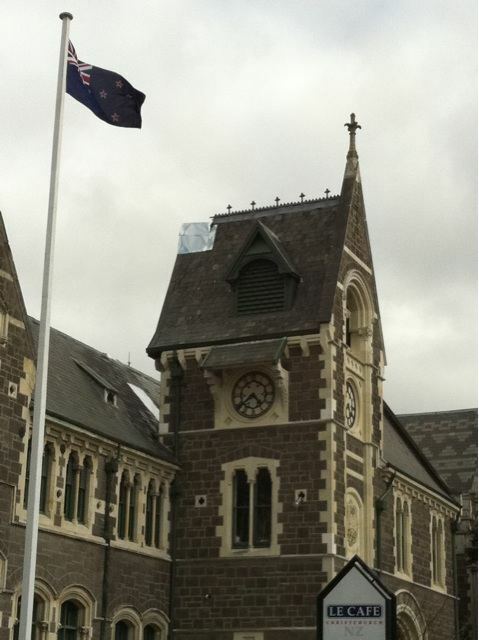 Maybe it was just to make sure Christchurch was still there – especially since the Cathedral is clearly visible from the motel entrance. Maybe the quake has raised people’s awareness of the city they live in. Now, each morning when I get the newspapers around 7am, I take a quick shot of central Christchurch and a hopefully topical part of the morning paper to share with everyone. So join me and enjoy the best city in the world 7am series. Great news for lovers of Indian at it’s Best. Himalayas is preparing for a return to its original site, hoping to be open in a new building around the end of Jan or early Feb.
Getting our favourite Indian back within our 2 minute walk limit – gets a big tick from us! JD (co-owner) dropped in yesterday with the good news and Aman (co-owner) came to see us today with some new menus and the latest news. According to them, the land under Himalayas Restaurant and the next door Pretty Things dress maker (before that it was a shop selling yesteryear items) is to be cleared and rebuilt. At this stage Himalayas is planning to have a wider street frontage but it’s still to be confirmed. 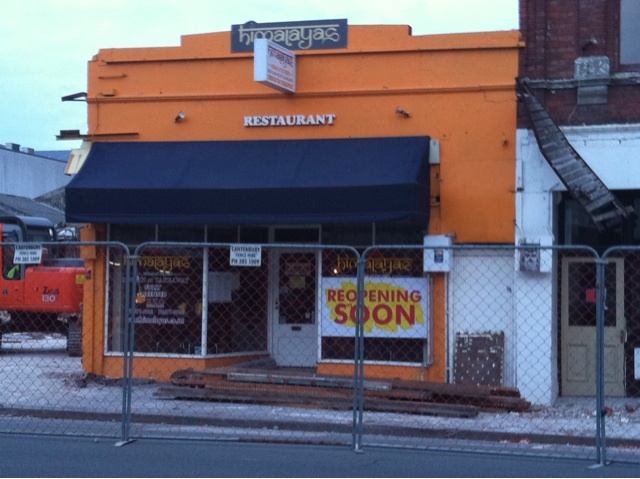 Until then, Himalayas is happily providing takeaways and deliveries (no dine in) from 101 Main North Rd., Papanui. They will happily deliver after 5pm to almost anywhere in Christchurch. JD and Aman have built up a restaurant with a reputation for good quality Indian food and so we were shattered to loose them from our list of recommended restaurants after the 4 Sept. quake. It was heartbreaking to see the glasses with the yellow serviettes sitting undamaged on the tables amongst the destruction that nature had wrought on us. This typified Christchurch’s disaster with some parts left untouched but others so close to ruins. We were buoyed soon after the quake when a “Reopening Soon” sign was up in the window and we are wrapped to hear that plans are in place for a reopening and getting back to normal. Yes, having great Indian food within 2 minutes walk is one measurement of normal! No doubt it’s been a tough 3 months for Aman and JD but they have stuck at it and not given up on their dream to establish a great Indian restaurant in Christchurch. So we say thanks for staying round, for taking the hit but standing tall and proud! Well done guys, your menus will be back in the room compendiums tomorrow and we look forward to getting some great Indian in the next few days! Many thanks to all those who “liked” our entry in the TIA (Tourism Industry Association) Photo Competition. We won! Our photo has been selected to be the picture for September in next year’s calendar. Very timely with the Rugby World Cup starting in that month! 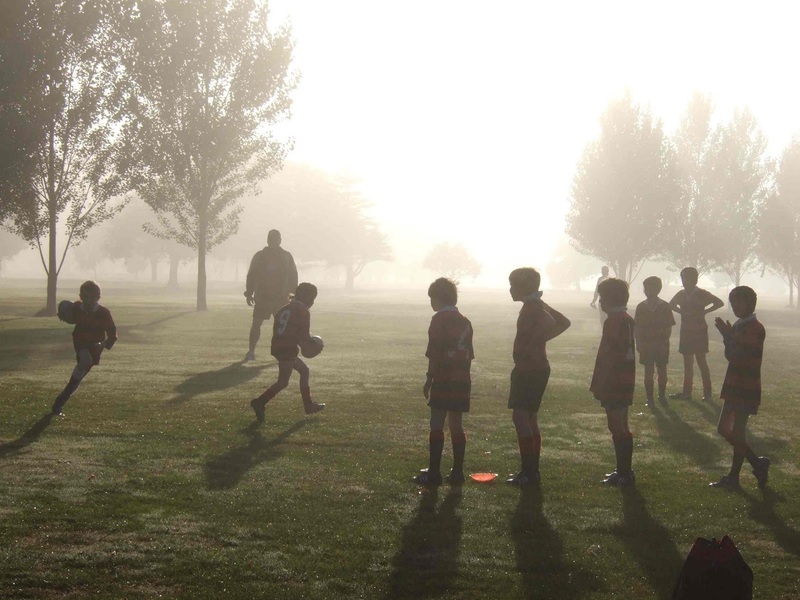 The photo is of mr11 warming up for a game in the mist at Hagley Park one cold winter’s morning. It was Naomi who was standing in the cold slowly freezing when she took the photo. Our photo received a total of 57 votes. So a really big thanks to everyone who supported our photo, our motel and Christchurch & Canterbury. The biggest thanks goes to the older generation, who battled on to discover just how to “like” our photo (including us!!). Be proud and happy - you’re now ready for next time and also ready to compete with the younger “click click click Facebook” generation who always give you THAT look when you ask how to do something online. It’s times like these you find out just how many real friends you have and it looks like we do not have that many. We kind of knew that we are in the lower level of “friendliness,” meaning that while we don’t have a multitude of friends, we’re not in the single digits either. 49 people like our CentrePoint on Colombo Facebook page, Naomi Peters has 52 friends and Jeff Peters has 21 friends. On Twitter there are 275 followers of our English account and 100 of our Japanese account. So yes, we are low level friendly people, we thought. But we are unsure if we are even that high up the “friendly” scale after seeing the number of votes for our Tourism Industry Assn. photo competition entry. At time of writing, only 20 people have liked our entry despite our efforts to make our campaign go viral. We have Tweeted, it’s on Facebook, we ask all our guests to log on and like it and have sent postcards to Aunties and Uncles. We even asked mr15 to spread the word to his many “friends” but that was voted down – looks like we’re not cool enough (again). Every year TIA has a photo competition to choose the next year’s calendar’s pics. We entered one that Naomi took of mr11 warming up for a rugby game in Hagley Park one cold winters morning. We made the finals, and now the last 12 (1 for each month) are decided by Facebook vote. Easy, we thought! We’ll just get our multitude of friends to vote for us – but after 4 days we have just 20 likes. So, what’s the problem here? Are our friends are not that friendly after all? Is the photo just not that likeable? Or are people having trouble with the double “like” process that is necessary to vote on TIA’s Facebook page? (first you have to like the TIA Facebook page and then the photo itself.) Or is our feeble attempt at viral marketing just that – feeble. Time, and the number of votes will tell just how friendly we are no doubt. Voting closes 25 Nov. so click on this link and vote for your favorite photo - hopefully it will be ours! The smallest number in this blog is 1, the biggest is 17.5 million, and there’s lots other great numbers in between. 6 weeks ago it started with a single text message after a 7.1 earthquake and today it ended with 124,000 Cantabs (1/3 of Christchurch’s population) enjoying 9 hours of continuous music from 29 acts and $17.5 million being raised from all over NZ for the disaster relief at the biggest ever concert to be held in New Zealand. Band Together was a free concert organized by NZ musicians for some light relief for Cantabs after the 4 September quake. Jeff, Naomi and mr 11 went but mr 15 found his own way there and back. Jeff’s Mum handled the motel which was much appreciated. Jeff headed off at 8.30 to get seat space and relaxed till others arrived. The music started on time and was a who’s who of NZ music. The depth that has developed in NZ music over the last 3 years is quite incredible and it really showed today. The last 2 acts were good but definitely old-school NZ music and Dave Dobbin’s act really struggled to keep pace with the newer talent on display. 124,000 earthquake victims were treated to a wonderful cultural display. The logistics were incredibly well managed, the whole concert it was all done to clockwork using 2 stages side by side. That so many acts could keep time is probably unheard of in the music industry and no doubt due to the event wide alcohol ban – and that appeared to include the singers. In the crowd close to us, yes we did see wine confiscated. Good idea but sober people don’t dance much. 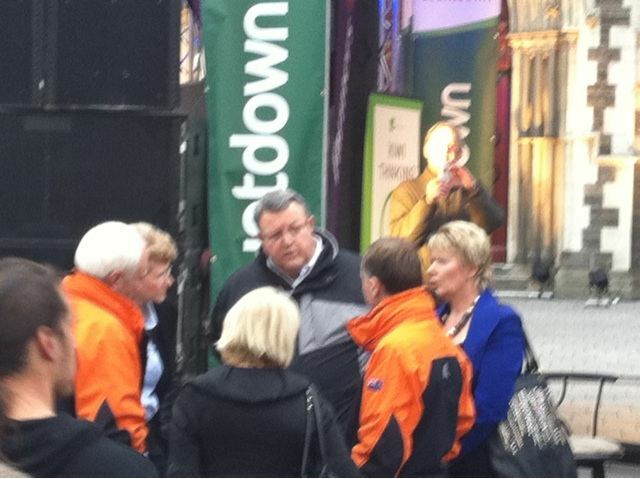 We were also visited by Mayor Bob Parker and Christchurch’s own John Key Prime Minister. So thanks NZ for coming to Cristchurch for the day, it was good. Tomorrow we get back to getting Christcurch back to what it was. I was alone in the room with Wild Man – a magic moment I hope everyone also has the chance to experience, but I doubt it because there will no doubt be a long queue of people lining up to see this true to life exhibition. I am not one to actively visit exhibitions although the pre-hype and an invite from the Christchurch Art Gallery got me to the preview one day before the opening and I was not disappointed. And after so much destruction around the city, and the venue being the Civil Defence Head Quarters after the 4 Sept. earthquake it’s great to see the Art gallery being an art gallery. The Art Gallery gets a thumbs up from me for organising this exhibition which is only being shown here. Ron Mueck is an intensely private person said Neil, my guide to about ½ of the exhibition whom had met Ron only days before when he was in Christchurch for the exhibition preparation. Yet, despite his quest for privacy, Mueck allows his inner self to be shared in this exhibition including the sculpture of his deceased father complete with Ron’s own bodily hairs and an in-depth video presentation of how this exhibition came about. This, the lack of physical barriers in the gallery and the raw power of the expressions that Mueck has captured means the visitor is enveloped in the exhibition rather than being a mere viewer. From the larger than life Pregnant Woman, In Bed and Wild Man to the minute yet intricate Youth, Two Women and Woman with Sticks, Mueck has created a surreal yet intimate world that will make you want to turn away with embarrassment. But don’t, along with expression of raw emotion is also the technical brilliance – these were all made, hair by hair, pimple by pimple by the artist. I recommend walking through the exhibition 3 times to soak up the artistic, emotional and technical aspects of this most wonderful exhibition. Exhibition at Christchurch Art Gallery Te Puna o Waiwhetu - 2 October 2010 to 23 January 2011. Book your Christchurch accommodation at CentrePoint on Colombo Motel. The Gallery says the graphic material may not be suitable for everyone. 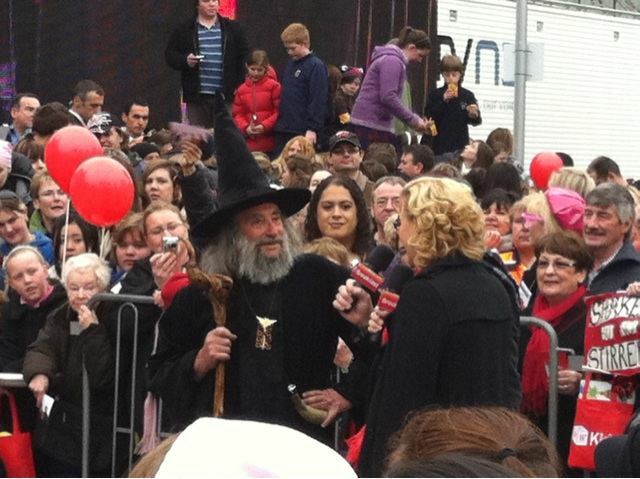 A big Shout Out to Television New Zealand! It could be said that never before has Cathedral Square been so crowded. A lot of people go for the New Year concert but this was standing room only, shoulder to shoulder – packed. TVNZ made the decision to move the Auckland based morning show “Breakfast” to Christchurch for Breakfast for Canterbury on 24 Sep. – a way to show solidarity with and give strength to those devastated by the Sep. 4 quake. Both our sons (T2 and T1) were keen to go and so we headed off just after 6.30am. We entered an already crowded Square to which only more bodies were added. 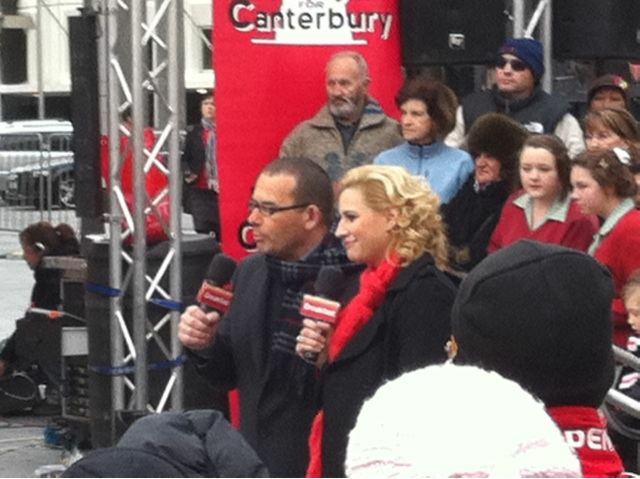 The area in front of the Cathedral was given over to the TVNZ programme and Paul Henry, broadcasting personality of the year this year, Pippa Wetzel, Tamati Coffey and Corin Dan lead a plethora of personaities including The Wizard, Crusaders Coach Todd Blackadder, and members of the Canterbury Rugby Team etc. etc. During the add breaks we were entertained by such local acts as Stella, Kids of 88 and The Feelers. It was good. 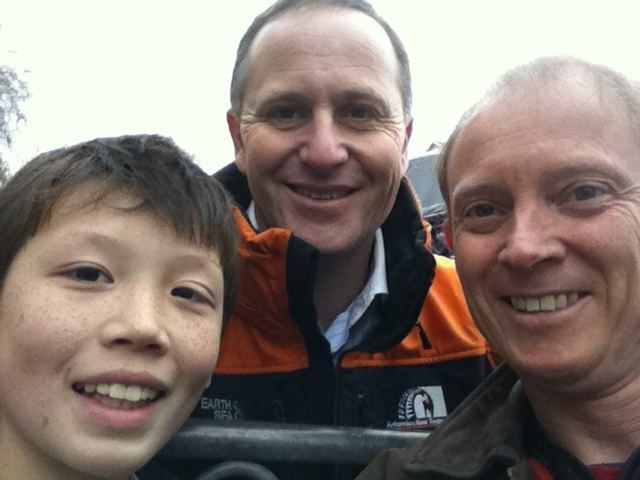 Also present were Prime Minister John Key, earthquake reconstruction minister Gerry Brownlee and Mayor Bob Parker. At one stage they and 2 others were in the middle of the set talking away animatedly, don’t know what they were talking about but it did add to the whole feel good atmosphere. And just the fact that the whole of New Zealand had come to Canterbury this day was indeed something special was evident in the intense yet jovial, excited yet serious feeling enveloping the crowd. While the odd bunch of school girls added some colour in their own way there was not an over supply of exultation in the crowd. More than anything, everyone was pleased to have something so special to take their minds off the reality and they were happy that New Zealand had come to Christchurch for 3 hours. Thank you TVNZ. What makes New Zealand such a great place? Read this and find out. We went to the Square, T1 on his bike and Naomi, Jeff and T2 went on foot. We got close to the front and while I could see, T2 was stuck in his 130cm low hole, surrounded by adult bums and backs. 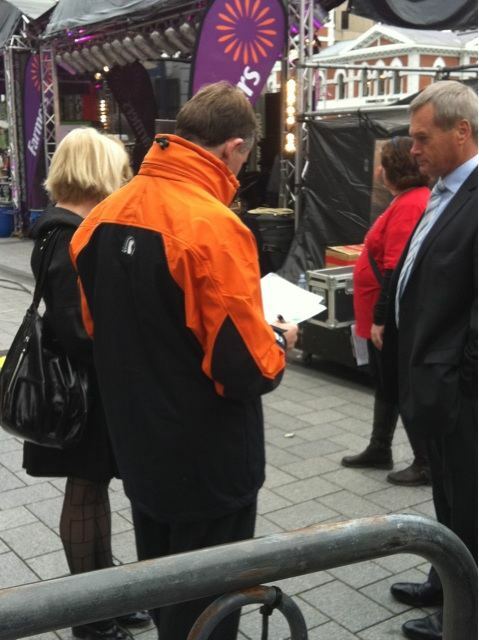 But he was keen to get to the front to do something to be able to say “I was there.” He did get an autograph card and managed to get several signatures but other than that spent most of the time reading clothing labels. Today was the last day of the school term and so we couldn’t wait round till the end at 9 and so started to head home when T2 said, “lets go backstage.” Reluctantly I said, “OK,” and we walked past patrolling police officers to the barriers. What we found was Prime Minister John Key reading an official looking briefing paper – no doubt about Canterbury reconstruction! Took a couple of photos of our boss hard at work but then he put it down and wandered over to where we were. After talking to another person John was right in front of us and so I asked can we get a photograph?” “Sure,” said John and I got out the camera, “is that the new iphone4,” asked John and I replied “yes.” He asked me how it was and I think I may have said something like that it was bloody good! We took the photo, shook his hand and I thanked him for coming down here today and for all the help he was giving Canterbury. T2 then found a local act, Kids of 88 that had played live and is making a name for themselves and got a photo with them – he was just so happy. It is this kind of spontaneity – being able to meet, chat with and take a photo with the Prime Minister or a Popstar that sums up how great life is in New Zealand. And no matter how much the earth moves, it can’t take this away from us. 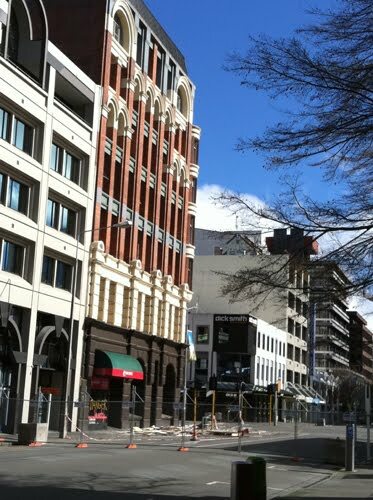 Photos from post quake Christchurch. 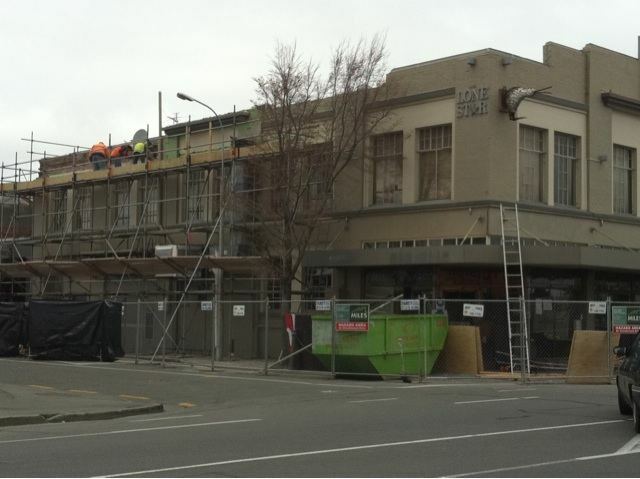 See our previous blogs for news about how Christchurch is well on the road to recovery! CentrePoint on Colombo Motel is open for business. 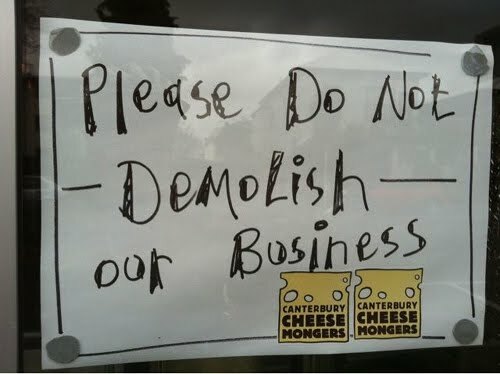 We lost our beloved Canterbury Cheesemongers, our hearts go out to Martin and Sarah (we hope they find a new shop soon) and all the other small businesses which have been forced out of business after the quake. On day 6 the punting resumed and then on day 7 the Tram was running and playing chess in the Square was possible. 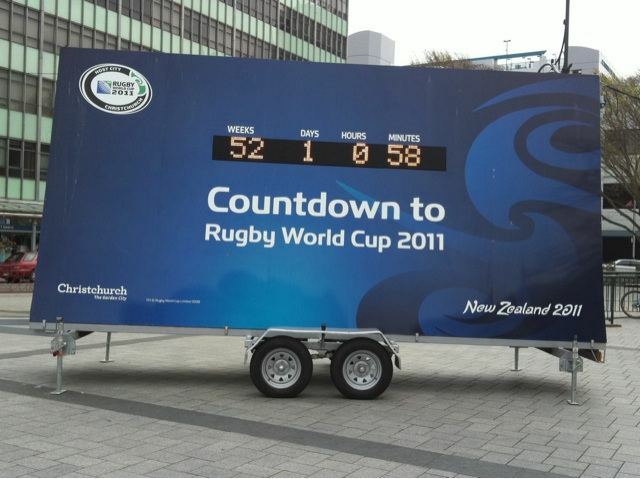 On a positive note, we were in Cathedral Square to see the Rugby World Cup 2011 countdown clock go 52 Weeks 0 Days 0 Hours 0 Minutes. One year to GO! Road closures round the city made the city eerily quiet and deserted, and we feel for the business owners who are on the wrong side of the barriers. It is still not certain if the MLC building, the tallest building in Christchurch when built in 1906 and a true beauty of a structure, will be saved. 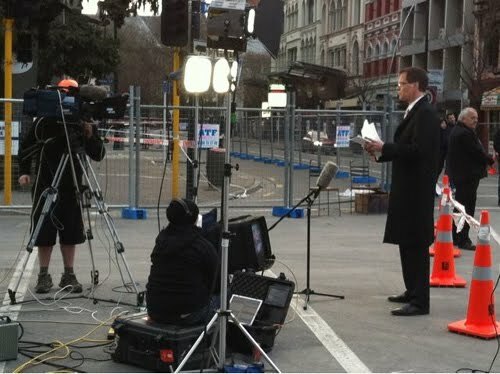 When I was out and about, then cordons were relaxed close to 6pm and I was able to photograph the start of TVNZ news on Friday 10 September. To make the city safe, cleanup continued into the darker hours of the evening. 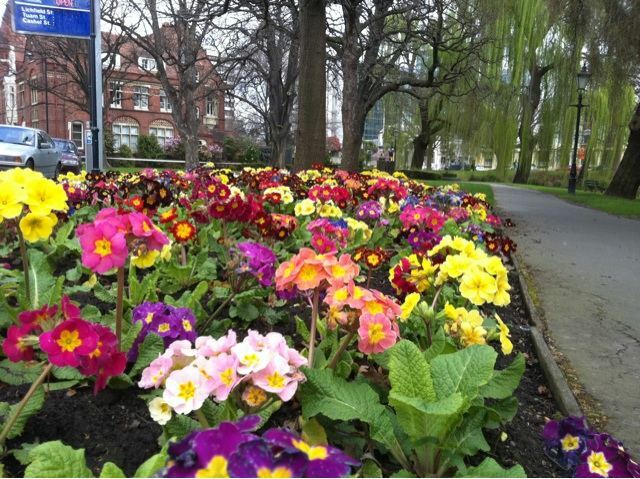 Amongst all the despair, some parts of the city just kept on being Christchurch and the blooms of the season added colour and beauty. 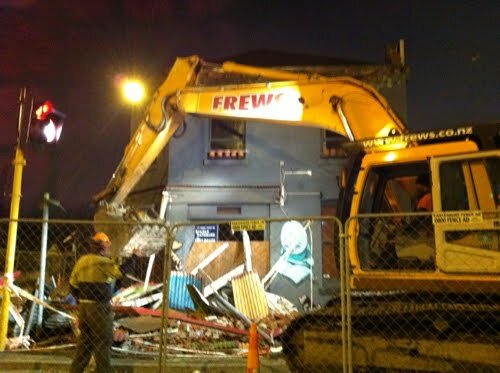 The unfortunate demolition of buildings means that photos can be taken from previously unseen angles. This was the Asko Furniture building on the corner of Victoria and Salisbury Sts. And also the site of Canterbury Cheesemongers. The Arts Centre received damage that will take years and millions of dollars to repair and while is currently being patched up, parts of it are still operating including the cafes, restaurants and the Court Theatre! 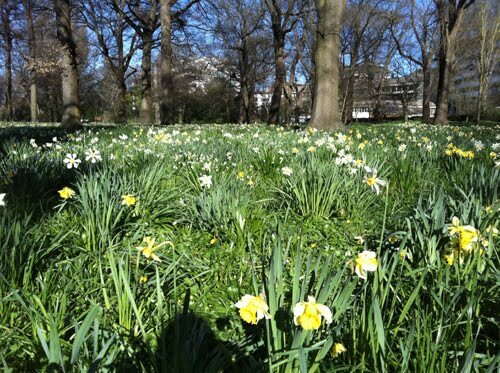 And remember there is always time to walk to the Botanical Gardens to get some quality time! We welcome you to read both this and previous blogs about the Canterbury earthquake and how are well on the road to recovery! In 2 days it will be 2 weeks since Christchurch shook violently at 4.35am on 4 September. A lot has changed in these 2 weeks and they are still changing – evident by the sporadic aftershocks as the ground settles into its new shape. 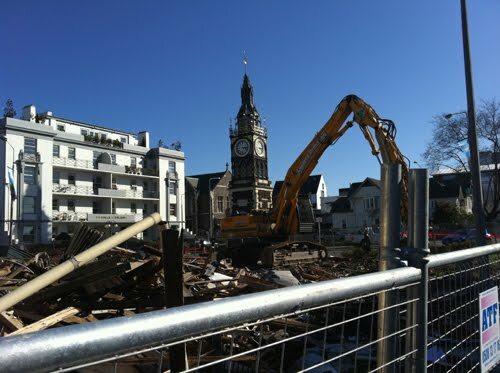 We experienced the disaster first hand, dealt with it and soon realised that while damage was widespread, it was not the end of Christchurch as a beautiful city. 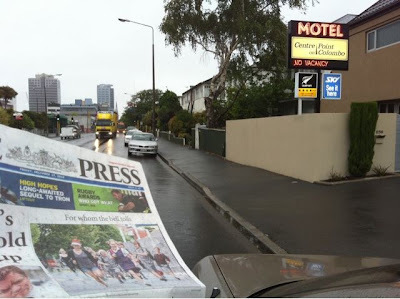 Unfortunately international media reported that our city was in ruins – images of the one building that caught on fire when electricity was turned back on went around the world mainly because PM John Key and the media were touring the area when it happened! The camera operator could have at least panned to either the left or right and shown undamaged buildings as well! In reality, there was a travel advisory for the first week and a State of Emergency was in place, but we were certainly not going the way of Pompei! Starting off on the back foot and then getting kicked while we were down meant we had to try hard to get our message out that Christchurch was still open for business – and tourism and that meant for a busy week. We got info onto our web site straight away guiding people to our blog which inturn led to Twitter and Facebook. We then blogged, Tweeted and Facebooked the week away, getting a balanced message out to those who wanted some info apart from the mainstream media. 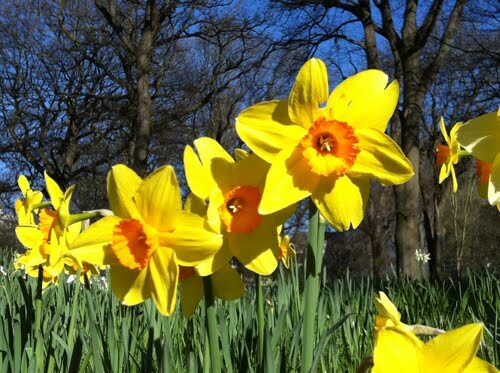 We cannot ascertain how much effect all our efforts had but we are pleased to be able to say that accommodation cancellations were limited and have now stopped – thanks for having faith in us and Christchurch! We have also been pleasantly surprised by the number of messages we have received from people commenting positively on what we have been doing. 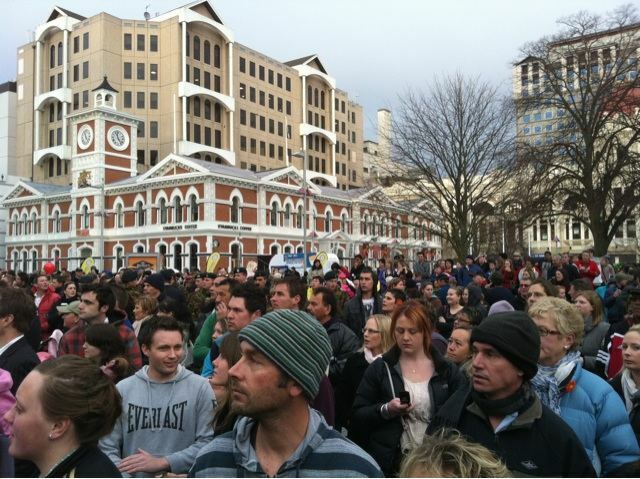 So how is Christchurch now – physically it’s a lot better than last week but politically things are heating up. The adrenalin and focus on getting through the first week has now given way to some stark realities as communities and individuals try to work out how to get back to normal and come to the realisation of just how long it may take. We also have a Mayoral and City Council election coming up so there is many a matrix operating there! For Christchurch residents in some parts of the city reconstruction is going to be a long term reality. As for tourism, Christchurch and Canterbury Tourism said last week that 98% of our areas tourism activities / attractions etc. were operating normally. Not really sure what makes up the 2% that aren’t but clearly some of the Arts Centre is contributing. While largely visually intact, parts will need intensive TLC over the next year or so to return it to its former glory. Probably one of the hardest hit sectors has been the restaurant industry. Many restaurants, including close by South of The Border, Himalayas and Café Valentino remain closed. See here for a full and up to date list of what is happening to your favourite eating places. 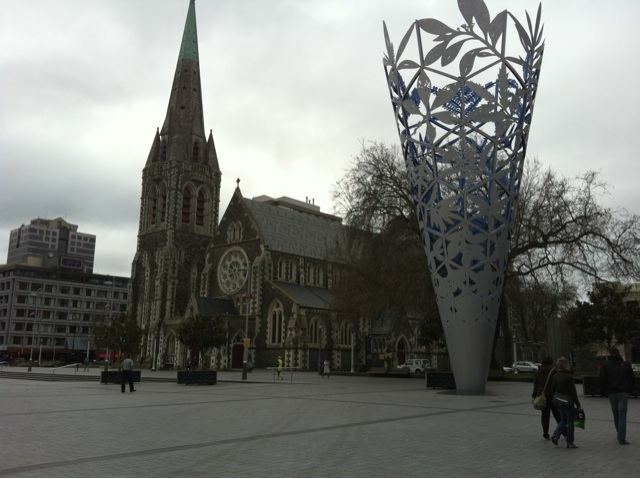 But the overwhelming message is that Christchurch is still a great place to visit and it is open for business. The State of Emergency has been lifted as of 12 noon, not that it will make any real difference to our lives, mainly an administrative issue. But still, it is probably easier to make a decision to visit a city if it does not have such a State of Emergency! Things are looking up in Christchurch. Victoria Street, which lost a lot of its older buildings, reopened yesterday and means traffic will now flow smoother. Other parts of the central city are being tidied up and there are now few areas off limits. In reality, there are large parts of the city where it is difficult to tell there has been such an earthquake. Christchurch is very much alive! We say to everyone far and wide, come and visit Christchurch, people are the life blood of a city and you need to be a part of it! 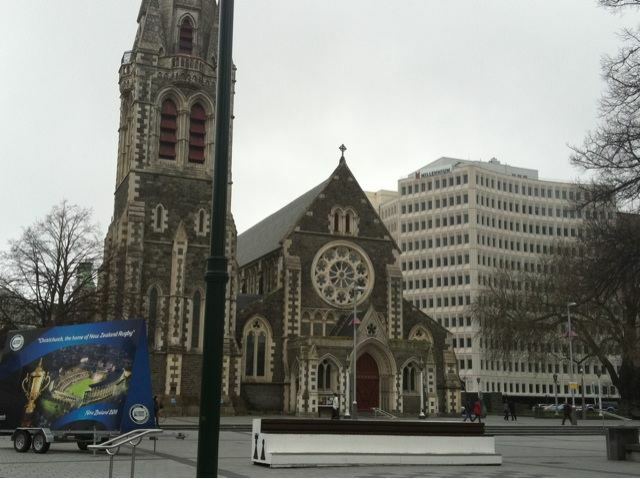 "We urge everyone to not cancel your plans to visit Christchurch. Please come to the Garden City as planned, we’d love to see you all here." This is a standard reply to everyone, thanks for taking the time to read it.Thankfully our family is safe, and the Motel did not sustain any damage. CentrePoint on Colombo Motel is fully operational. Over the last week, we have told it, in both words and pictures how it has been. Some parts of Christchurch were a mess, and some places still are, but it’s getting better fast. We urge everyone to not cancel your plans to visit Christchurch. Please come to the Garden City as planned, we’d love to see you all here. Many people who have stayed with us before or booked to stay at CentrePoint on Colombo Motel in the coming weeks and months have emailed us with kind messages of support and encouragement and we thank you all for your kind thoughts. The Christchurch and Canterbury region was rocked by a magnitude 7.1 earthquake at 4.35am on 4 September. 8 days have now passed and sitting in the motel office I can feel the aftershocks but if standing up and doing something they pass unnoticed! Not to say that they are all gone, we are still being told to be careful. These aftershocks have been unsettling to most Cantabrians but they are an ironic reminder of our 19 years in Japan. We rock ‘n rolled there a lot! Friday evening (10 Sep.) most of the cordons were lifted although there were very few people at the bars etc. in SOL Square and Lichfield Lanes. But there are reports that most retailers are trading today (12 Sep.) and people are there - the city is pretty much open for business! 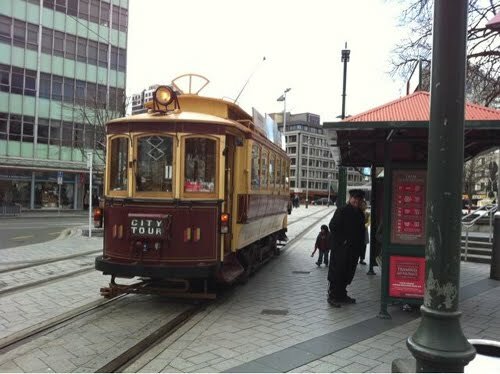 Also on Friday, the Tram started operating and so now 98% of tourist activities / attractions / accommodation are well and truly operating normally. Sorry, don’t ask me about the 2% that are not! City wide transport is operating, Civil Defense is out of the Art Gallery and it will reopen Monday. Supermarkets are all open and there will only be a few schools not opening Monday. Our beautiful Arts Centre needs a little TLC before re-opening and the inside of the Cathedral is off limits for now – they held today’s service outside in the Square. And my municipal gym is not open yet! There are still a few roads closed, Kilmore St. between Manchester and Colombo and the Manchester / Hereford intersection and there will be a few delays as a few more buildings get tidied up. So how is Christchurch? Close to the Motel, the older buildings have been seriously damaged and some of our favorite restaurants within 2 minutes walk will unfortunately not be reopening for some time. Apart from that, roads are undamaged and there are very few signs of the disaster we experienced. The central city area has isolated pockets of damage. Some buildings have been damaged and are being demolished but others are fine. Ironically, some of the really old and dilapidated stuff is still there!! Parts of the eastern side of the city, closer to the coast and near the rivers (mainly residential) did not fare as well. This is where some of the most serious damage, often caused by liquefaction, occurred. Many roads, power poles, houses, lawns and footpaths are in need of a lot of repair. Initial estimates are that 100,000 houses have been damaged in the quake and this statement is one way of summing up the situation. Christchurch is not in ruins, rather the damage here and there over almost the entire city and probably no-one is unaffected. Even for us, the residential part of the motel (where we live) received cosmetic damage when a neighbouring chimney fell across the boundary. So what do we say? Come to Christchurch as you were planning. We are getting better and better everyday and by the time you get here the main parts of the city should be back to normal. Us Cantabrians are a resilient lot and bounce back pretty good! and we welcome you to follow the Garden City’s progress. Day 6 after the quake and another bicycle tour of central city Christchurch. 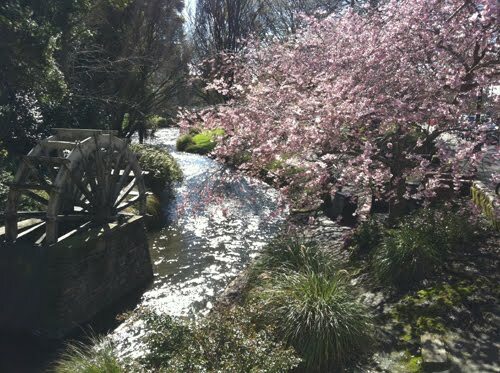 If you avoid looking at the damaged buildings and closed off parts of town, it looks and feels like Christchurch always has been – a beautiful place! Lots more big news today. 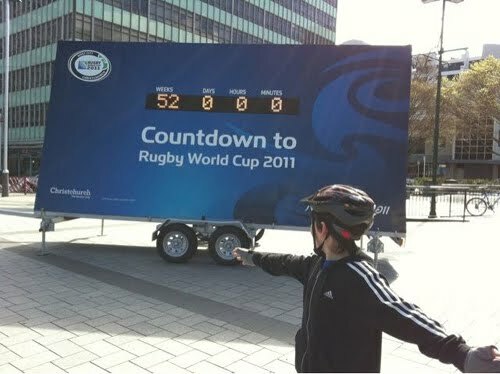 It’s one year to the start of the Rugby World Cup 2011. Christchurch will be ready! Lone Star Steak House is a popular place and the work is already underway to return it to its former glory. 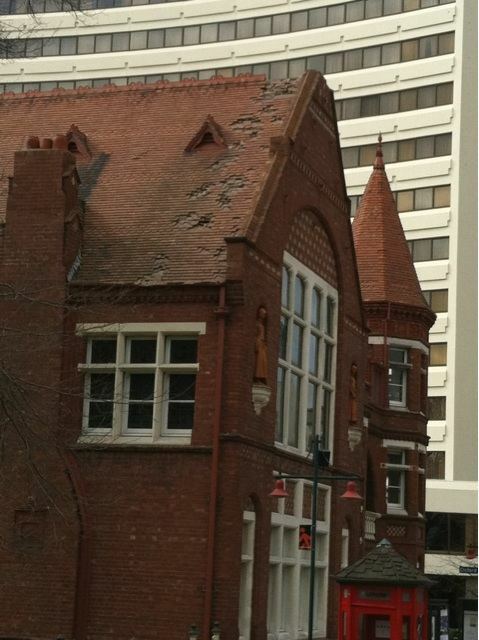 The Arts Centre, while earthquake strengthened, has unfortunately lost some parts off the top. We wish it well and a very speedy recovery! Art Gallery – the Civil Defence HQ, and not one pane of glass broken! Our City Otautahi, the first city council chambers also lost a little off the top but is still a proud member of our heritage buildings. 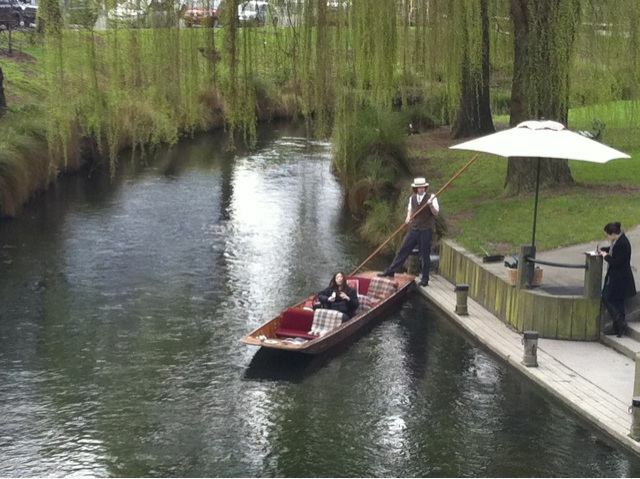 Punting – is operating from today!! And a visitor took the chance to enjoy a peaceful trip down the river! 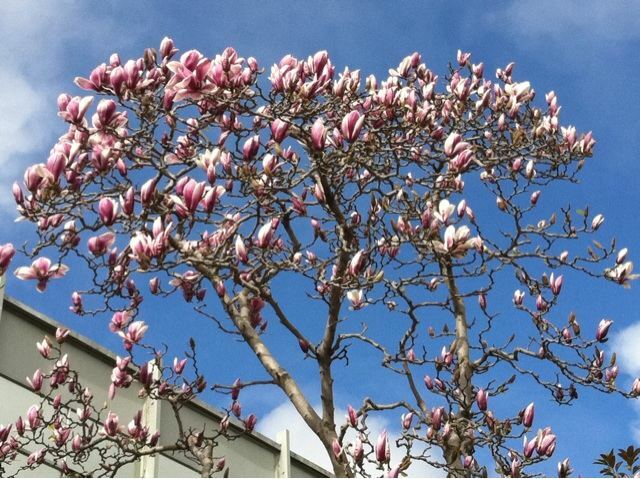 And amongst such a horrible natural disaster, nature is showing its beautiful side as well - Magnolias are in full bloom in Christchurch there’s plenty more colour as well. Went into town again by bicycle to see how Christchurch is faring on day 5 Wednesday 8 September. Lots of big news today. 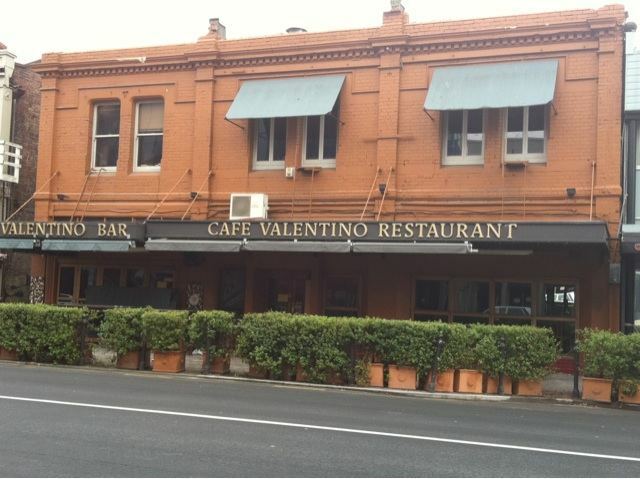 Café Valentino, a great watering hole which did not look good after the quake, is being tidied up and maybe open for the weekend. Now that is good! Even Bigger news! Cathedral Square is open! Not many people there but it is official, the square is accessible and I was there. In addition Colombo St. and most of the City Mall is open too. There are still some areas blocked off due to worries about the Westpac building but there are shops open, there are restaurants open. 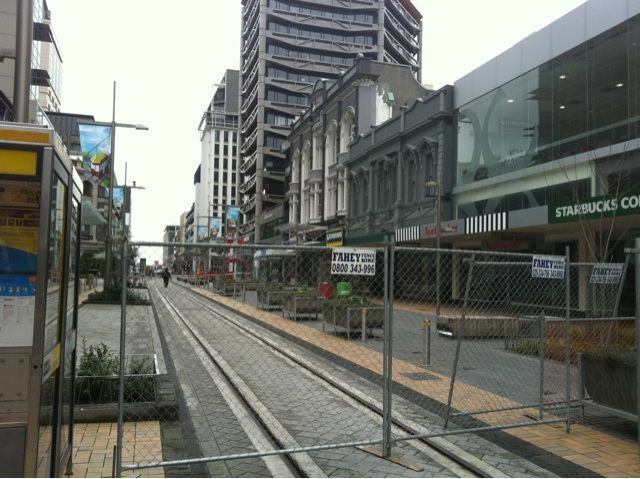 Christchurch is getting back to normal! The IRD (tax department) building is behind the barriers too! I tried to take a photo but it didn’t save – too taxing on the camera maybe! If it is behind the barriers, can I avoid paying my taxes?? 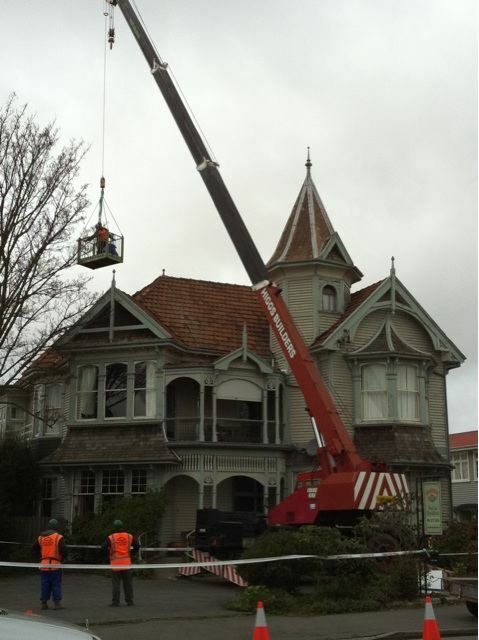 On the way home, there was work being done on the Wharetiki historic Edwardian house over the road from us. The Chimney had fallen through the roof and so needed a blue sheet to protect it from the elements. Christchurch, you’re looking better everyday!